With Disco Corp. holding more than half of the global market for thin wafer processing and dicing equipment, the competitive landscape of this market is highly consolidated, finds Transparency Market Research (TMR). The company accounted for a share of 56.4% in 2015 and is likely to grow substantially over the next few years, creating a monopoly in this market. As per the report’s estimations, the global thin wafer processing and dicing equipment market, which was valued US$388.9 mn in 2015, is expected to rise at a CAGR of 6.80% during the period from 2016 to 2024 and increase to US$692.5 mn by the end of the forecast period. The conventional dicing technology, blade dicing, has been witnessing the most prominent demand across the world. Although this segment is expected to remain leading over the next few years, the laser dicing segment is likely to prove more lucrative for manufacturers in the near future, states the report. 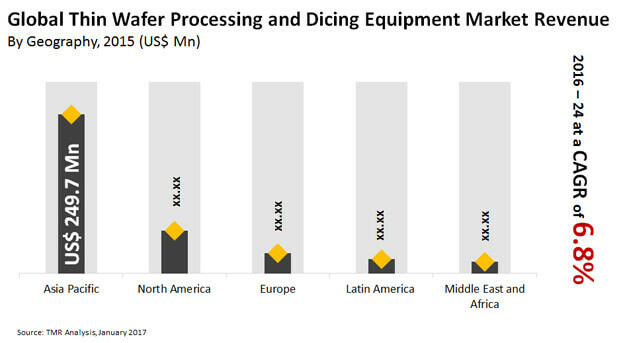 The report considers North America, the Middle East and Africa, Europe, Latin America, Asia Pacific as the key regional markets for thin wafer processing and dicing equipment and presents a comparative analysis of these markets. According to it, in 2015, Asia Pacific led the global market with a share of 64.2%. Researchers anticipate the regional market to remain dominant over the period of the forecast, thanks to the surge in the application of thin wafer processing and dicing equipment in small consumer electronics devices, such as mobile phones and several other communication and computing devices. Apart from this, the rising usage of thin wafer processing and dicing equipment in semiconductors is also anticipated to boost the Asia Pacific market in the years to come. Taiwan, China, and Japan are likely to lead this regional market in the near future, owing to the lucrative opportunities they provide to the manufacturers. The North America thin wafer processing and dicing equipment market, among others, is predicted to experience a significant rise in its valuation over the forecast period. The technological advancements in consumer electronic devices and the development of state-of-art smart home devices and wearables are likely to stimulate the demand for small integrated circuits, which, consequently is projected to boost the demand for thin wafer processing and dicing equipment in this region over the forthcoming years, notes the study. “The increasing demand for portable communication devices, such as memory cards, smartphones, smart card, and various computing devices is having a significant impact on the global market for thin wafer processing and dicing equipment,” says an analyst at TMR. The surge in the uptake of thin wafers, in a bid to develop technologically advanced smart home devices and wearables, is stimulating the demand for thin wafer processing and dicing equipment across the world, reflecting greatly on this market. In addition, the increasing demand for three-dimensional integrated circuit (3D IC) is likely to add significantly to this growth over the forecast period. However, the high cost associated with the purchasing and maintenance of thin wafer processing and dicing equipment may hamper the market’s progress in the near future, states the report.